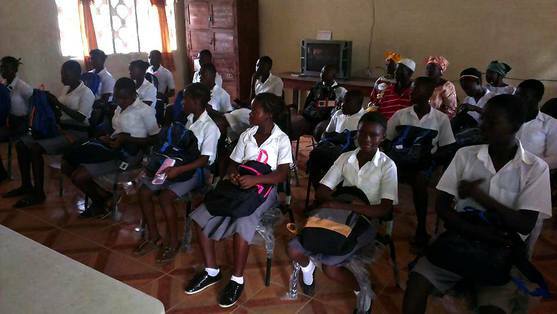 They are among the approximately 1600 students served by the Yonibana Secondary School who worry daily about whether or not they will have enough money to continue their education for the next school year. Since education is not free in this region, students work countless hours on farms to help generate whatever little income to help support their family’s living expenses while funding their education. Unfortunately, time spent on the farm equates to time away from studies and making the most of schooling. As a result, there is a high dropout rate among children trapped in this situation. Note also that Sierra Leone was among the countries devastated by the recent Ebola outbreak, thus leaving many children without parents to manage this important aspect of their development. We believe we can help create brighter futures for these students and many more. But, we need your help. For the third year in a row, Me Against Poverty, Inc., plans to raise funds to alleviate the burden faced by students in this community. We will like to continue providing educational assistance/scholarships for at least 20 students that can be applied toward tuition and various school materials (uniforms, back packs, note books, pens and pencils). Through our ongoing communication with the Yonibana Secondary School, we’ve confirmed that it will cost approximately $100 per student to cover the cost of one year’s tuition. Me Against Poverty also plans to cover the cost for shipping school supplies to Sierra Leone, distribution of school materials, providing tuition funds and meeting face-to-face with students to initiate an ongoing mentorship program. We are also accepting backpack donations with school supplies. Your support and donations will go a long way. For each of our supporters, Me Against Poverty will send you an official bumper sticker as a thank you as well as provide timely updates on our progress and other worthwhile initiatives through our quarterly newsletter. We appreciate your help in this endeavor and welcome you to be a part of our team as well. Currently, Me Against Poverty is composed of 7 members who are committed to and believe that we can “educate to eradicate poverty”.